North Carolina’s new State Superintendent, Mark Johnson, came to Charlotte today on his “listening tour” of the state. In his end-of-the-day press conference, he spoke highly of school bus drivers, and of Project LIFT. It was good to hear him voice support for traditional public schools and what they could do for children. He said that business leaders across the state – including members of the Charlotte Chamber – had been urging him to beef up workforce development programs. 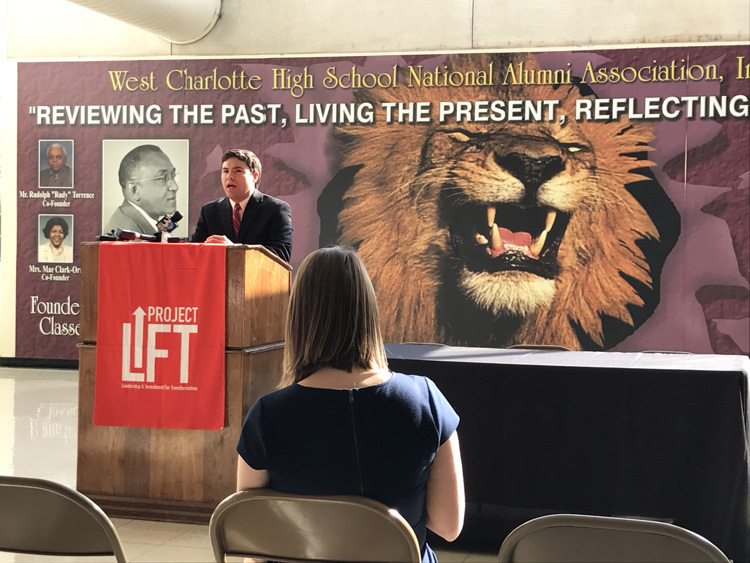 He introduced one “alternative fact” – claiming that West Charlotte High School’s current proficiency rates were the highest they had been in the school’s history. It did not appear that he had done much listening to parents about standardized tests. Like many educational “leaders,” he proclaimed that too much time and energy was being put into high-stakes standardized tests. But when pressed about which tests and stakes he would actually eliminate, he fell back on the idea that giving multiple standardized tests throughout the year – aided of course by the wonders of technology – would somehow eliminate the stress and curricular distortions high-stakes testing has produced. He does not plan to confront state legislators over high-stakes A-F school grading, or other state-mandated uses of test scores.